And when I say “we” I probably should say “I,” because I was the one who fell down most badly on the job. We had a great, monumental riff that might still be echoing down through the ages if we’d ever committed it to vinyl, and although the song structure was never finalized, it was the sort of thing we could and often did jam on for hours. The main thing the band was waiting on was for me to finish writing the words and to make the sometimes arbitrary distinctions that divided verse from chorus and chorus from bridge, which tended to be my main job, and which I was often painfully slow at. So slow, in fact, that maybe a dozen potentially great songs are now lost forever, because even if I finally came up with the words, I’d have forgotten how to play the music, and so, I’m certain, would any members of the band, past or present. As a result, “Going To Humboldt” will remain a “You had to be there” moment, as in fact, the actual act of going to Humboldt most often was. It can also be a hopelessly vague or misleading concept, and not just because of the mind-zapping powers of the region’s most famous agricultural product. Those of you familiar with Humboldt County will know that it’s an awfully big place, larger than a couple of states, and the coastal regions of Northern Humboldt differ so drastically in climate and terrain from the heavily forested mountains to the south and east that they might almost be on different continents. So where exactly are you headed when you tell someone you are “going to Humboldt?” In the case of our band, it was as much a state of mind as a geographical destination. Basically it meant heading up Highway 101 until the city lights of Berkeley and San Francisco were a distant memory and the forests and mountains and quirky little towns conspired to tell us that we had arrived back in our true spiritual home. Poster for the event sponsored by The Book Juggler in Willits. Our drummer was the only true Humboldter (Humboldtian?) among us, having grown up just north of Garberville, but I had spent much of the previous decade on Spy Rock, which, if you’re thinking in terms of bioregion or indigenous culture, has more in common with Southern Humboldt than it does with the rest of Mendocino County. Our third member, Patrick Hynes, he of the lilting, haunting guitar and bass lines so immediately specific to the Potatomen, was East Bay born-and-bred, but he too embraced the Humboldt mystique with the avidity of a native. It was his plangent guitar tones that brought to life one of the saddest and most heartfelt songs on our first album, which was an ode to Eureka, a town that at the time seemed fated to live forever under the foul shroud of its pulp mill-poisoned present and the dark cloud of its brutal, Indian-slaughtering past. Within short order we had also come up with songs about Arcata and Ferndale, covered the Brent’s TV song about Trinidad, and even given, in “The Train Song,” a namecheck to obscure little Blue Lake. 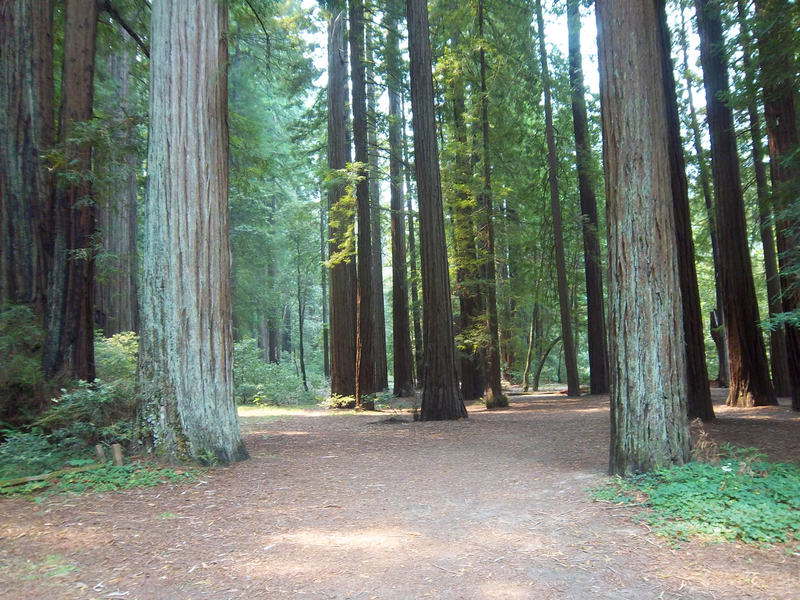 I mention this not to big up the Potatomen, but to show that my connection to the North Coast, the Redwood Empire, the Emerald Triangle, whatever you want to call it, runs deep, and no matter how long I stay away, is not easily severed. It could still happen. A million miles from Brooklyn in some regards and right around the corner in others; if I could make the transformation from Spy Rock wilderness to first London and then New York City, who’s to say I couldn’t once again feel at home strolling across the Plaza or queuing up for coffee at Los Bagels? No, I’m not packing my bags for Humboldt just yet, nor am I planning to bail on Brooklyn, but I am still luxuriating in the afterglow of the past couple weeks spent touring my old Northern California stomping grounds, copies of Spy Rock Memories in hand. It would be too grandiose to call it a “book tour,” as my mother and other partisans insisted on doing, since I only did two official “readings” and a handful of interviews. But I also busied myself paying visits to many of the region’s far-flung bookstores to ask if they’d be interested in carrying Spy Rock Memories, and in doing so, took advantage of the opportunity to soak up the atmosphere and spectacle of one of the most beautiful and, some might argue, bizarre places on earth. US Out Of Humboldt County, the bumper stickers used to proclaim in the 80s, and while you don’t see too many of those anymore, there are parts of the Emerald Triangle where you’d be hard pressed to find evidence that you were still within the jurisdiction of the United States of America or the State of California. The Triangle is its own land, and its own reality, and while the shopping districts of the bigger “cities” and the artsy-craftsy boutiques of the tourist meccas might look deceptively normal, you don’t need to venture far off the beaten track or, for that matter, the pavement, to learn that much of Mendocino and Humboldt Counties remains largely ungoverned and, perhaps, ungovernable. My trip began to take shape when I was asked by the excellent Book Juggler, a linchpin of the Willits cultural community, to do a reading at the local library. The library? This was heady stuff for someone who, back in the early days of Lookout magazine, was accustomed to being run out of town on a fairly routine basis. I don’t know who originally said it, but it was Jerry Garcia who I first heard explaining that, “like old whores and old buildings,” his band had, by hanging around long enough, actually become respectable. Could time be working a similar magic on me? 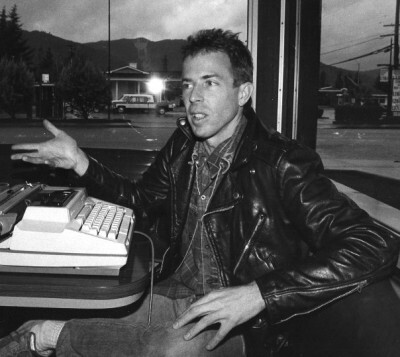 Larry Livermore holding forth with his (unplugged) electric typewriter at the Ukiah Denny’s. Photo by R.D. Deines for the New Settler Interview, spring 1986. Let’s not rush to judgment. When I arrived at the Willits Library, I found a reasonably-sized group – I think “crowd” might slightly be overstating the case – waiting for me, including a few old friends, most notably Holly Ferretta, whose family you’ll find mentioned in the Spy Rock Memories segment about home schooling, and Beth Bosk and R.D Deines, who’ve been publishing Mendocino’s iconic New Settler Interview for nearly three decades. Way back in the spring of 1986, Beth interviewed me for the magazine and R.D. 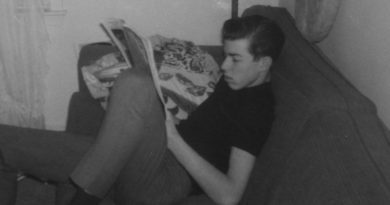 snapped the photo of me that has, more than any other, defined my public image ever since. I read several selections from the book, spoke at some length (didn’t catch anyone yawning, though), and took a few questions. I was well received, though Beth Bosk did take some slight umbrage at my suggestion that Big Timber, which used to run roughshod over the North State, had been replaced by a new 900 lb gorilla, namely Big Marijuana. Some version of this discussion would continue wherever I went for the next couple of weeks, with almost everyone agreeing that the near-complete takeover of the local economy by marijuana cultivation and sales had led to some unforeseen problems. The only dispute seemed to be whether those problems were manageable ones that could be solved by, depending who you talked to, either a stern crackdown on the industrial-scale growing operations that have all but supplanted the family-scaled farms of yore, or complete legalization (accompanied by regulation and taxation) of the cannabis crop. As it stands now, Mendocino and Humboldt are getting the worst of both worlds: billions of dollars flow in (and back out again, since many of the biggest grow-ops are controlled by agri-business interests from other cities and states), leading to a huge increase in crime and an ever-greater demand for public services; at the same time, both counties are effectively broke, barely able to meet existing obligations, let alone take on new ones, because probably 90% of their economic activity goes untaxed and unaccounted for. But let’s not focus unduly on the negative. I was here to sell books and cultivate literary interactions, not to rail against the grim state of local politics, and in that I’d say I was largely successful. 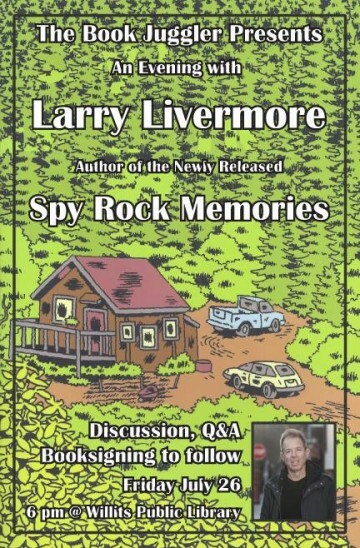 Stores now carrying Spy Rock Memories include, in addition to The Book Juggler, the Gallery Bookshop in Mendocino, the Mendocino Book Company in Ukiah, King Range Books in Garberville, Northtown Books and People’s Records in Arcata, and Eureka Books and the Eureka Co-op in, yes, Eureka. I guess I can count myself lucky that independent booksellers remain a thriving presence – there were a number of others that I was unable to get to before I ran out of books – and that they are so receptive to books about local places and people. If there was any disappointment, it was that I didn’t get to put books on sale in Laytonville itself. There is a bookstore there – like most North Coast communities, even a town of barely a thousand people is able to support one – but the hours it kept made it impossible for me to connect with the owner. And, to be honest, given some of my past adventures with the Laytonville citizenry, most often in response to things I had written in Lookout magazine, I still can’t help feeling a little nervous whenever I publish something new. 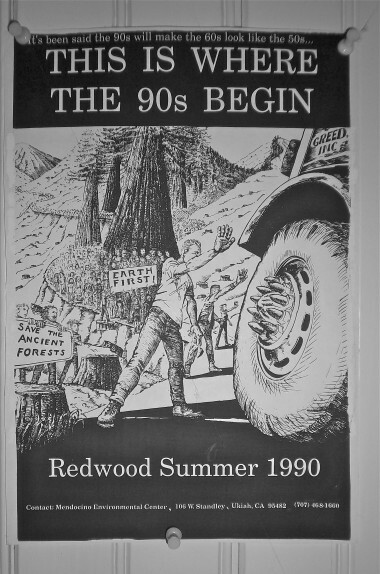 Redwood Summer poster, artwork by “M,” concept and slogans by yours truly. I envy Bruce Anderson, who’s long been saying more inflammatory things that I ever dreamed of in his Anderson Valley Advertiser and yet can stroll blithely around beautiful downtown Boonville with scarcely a care in the world (granted, it wasn’t always thus; threats of violence, lawsuits, even a couple of jail terms have dogged his journalistic journey almost from its beginning in the mid-1980s). I visited Bruce and his longstanding comrade-in-arms, Mark “The Major” Scaramella, at the AVA offices one Sunday night. They were busily putting together that week’s issue (the Major still uses the old manual paste-up method that I thought had all but vanished in the wake of full-fledged computerization), but they set their work aside and made time for a lengthy chat, during the course of which I noticed a copy of the original Redwood Summer poster hanging on the office wall. That poster, created by the AVA’s onetime editorial cartoonist, the mysterious “M,” along with some input from myself, is actually quite hard to find. There’s a copy of it in some university library I located online, but they wanted a bunch of money just to let me download the image. Bruce volunteered to let me take his copy, but it looked so perfect thumbtacked to his wall that I decided to settle for a photo of it. 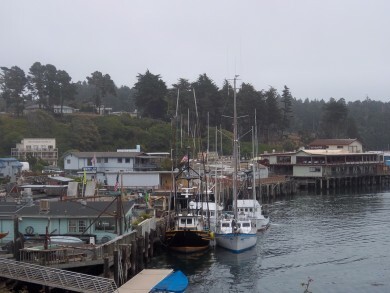 I spent a night in Fort Bragg, which during superheated summer days on Spy Rock, used to beckon as a cool gray refuge, with its own cinema multiplex and some decent restaurants enough to justify a two-hour trip over mostly dirt roads. But while the movie theater is still in business, the town itself felt a little more Twin Peaks-y than it did back in the day, and apart from the bars, most businesses were shuttered well before dark. The highlight was a stroll (except for one shopping cart-pushing tweaker, I might have been the town’s only pedestrian) down to the forlorn but picturesque Noyo Harbor, where a raccoon, accompanied by a posse of feral cats, greeted passersby by standing on two legs alongside the road and eagerly beating his paws together in apparent anticipation of a treat that, at least from me, was not forthcoming. I had enough dealings with raccoons during my years in the mountains. They are not generally nice creatures. The highlight of my trip, though, had to be the semi-urban triumvirate of Ferndale, Eureka and Arcata. Ferndale, an astoundingly well-preserved Victorian village, could be seen as a little creepy, especially late at night or when sitting in its hillside cemetery, which is where I was when I wrote the song “Toytown,” about what I imagined it would be like to grow up in an exquisitely beautiful but in many ways lifeless village populated mainly by elderly Republicans and tourists (I was wrong on the first count, it seems; Ferndale, I was informed, voted for Obama in the recent elections). For the past four years we have advocated two—and only two—alternatives for ridding our country of Indians: either remove them to some reservation or kill them. The loss of life and destruction of property by the Indians for ten years past has not failed to convince every sensitive man that the two races cannot live together, and the recent desperate and bloody demonstrations on Indian Island and elsewhere is proof that the time has arrived that either the pale face or the savage must yield the ground. In other words, by being so careless as to get themselves massacred (this particular massacre involved between 200 and 300 individuals, nearly all of them women, children, or the elderly) the Indians had somehow proven that they needed to be, um, massacred. I’d like to be able to tell you that over the course of the last century and a half, the Times-Standard has moderated its stance on this and other issues, and in fact it has, though as far as I know it has yet to acknowledge, let alone apologize for Eureka’s bloody past. I mentioned this to Lynette Mullen, who I met at Eureka’s once-monthly (and not to be missed if you’re anywhere in the area) Arts Alive festivities, and who keeps a fascinating blog on North Coast history. She has a special interest in uncovering and preserving stories of the horrendous treatment experienced by local Indian tribes. While I knew about some but not all the massacres she had compiled accounts of, I was completely unaware of the practice of killing Indian adults so that their children could be sold into slavery. I told her that I and many friends had long suspected Eureka might have something of a curse on it dating back to those bloody days, and although hers was a more scholarly approach than mine, she observed that we were not alone in thinking along those lines. Back in Ferndale, I had the honor of appearing on Larry Trask’s radio show. The best-known DJ on KHUM, Humboldt’s largest commercial radio station, Larry grilled me for the better part of two hours on Spy Rock Memories and a dozen related issues. By “grilled” I don’t mean to suggest anything even slightly unpleasant or intrusive; in fact, it was one of the best interviews I’d ever participated in (the other being a few weeks ago with Diane Farris on New Jersey’s WFMU). Larry had read the book, knew his stuff, asked excellent questions, and the only thing that worried me was how his listeners, who are normally used to hearing music during the afternoon, would take to us going on a lengthy talk binge. No one, as far as I know, called in to complain, though. A week earlier I’d done an interview on KMUD, the Garberville station where I myself used to work, and which I mention extensively in Spy Rock Memories because it played such a vital part in helping me learn what it means to live in and become part of a community. I was a guest on the Monday Morning Magazine, a time slot held down for many years by Michael Brennan, and in which I’d sometimes appeared, more often informally than formally, during my KMUD years. Michael was in the front row at my reading at Northtown Books in Arcata, which got off to a rollicking start: almost in the very instant I opened my mouth to speak, an earthquake rumbled through the store. Perhaps I was too wrapped up in the story I was preparing to tell, but it barely fazed me, and I shrugged it off as little more than maybe a 2.5 on the Richter Scale, a shaker that could be easily topped by a fully loaded logging truck passing by. But the more knowledgeable and experienced locals insisted it had to be about a 4.5, and they turned out to be exactly right. No damage was done, however, and I wasn’t about to be scared off that easily in any event, so we went on for a couple more hours. Late that night, as I was about to go to bed, I tuned into Arcata’s college station, KHSU in time to hear the Potatomen play “Empty Inside,” followed by the quintessential Crimpshrine song “Summertime,” the one that sings of going “back to Mendo one more time.” It was a song I’d placed on my Spy Rock Memories playlist, but hadn’t yet got around to playing at any of my appearances. Hearing it over the Humboldt airwaves again (thanks, Julie!) nearly a quarter of a century after the fact capped off a perfect day in that most perfect of places, and left me convinced that yes, you can go home again, even if it’s only for a little while. Headed south toward San Francisco and my flight back to New York, I passed Southern Humboldt’s biggest social and musical event of the year, Reggae On The River, and while I’d never been the biggest of reggae fans (to put it mildly) I listened to KMUD’s live broadcast from the site and marveled at the realization that some of this stuff was actually quite good. If it weren’t for the clouds of pot smoke that, astronauts report, can be observed from outer space, I’d be tempted to attend next year’s ROTR myself. So that’s my journey to Humboldt. I could go on for quite a few more hours and quite a few thousand more words, but I fear I’ve already tried my readers’ patience. Thank you to all who made my journey back to the promised land such a wonderful and rewarding experience, and I look forward to seeing you again real soon. Damn, sorry I missed all of this. wish I had known. Did just order a book however. I even listen to KMUD on the computer ever so offten but it has been awhile. A e-mail note to all of us who have posted would have been nice. I am in oakland like to talk to you one day…. Great read! I moved from Eureka two and a half years ago. I had a generally poor experience living up there, but your words helped me to put these items into perspective. I also love catching up to you again. I am a former fan of your column in MRR back in the days.